Here we go through the steps to convert a MkI Mini Van from an automatic gearbox to a manual gearbox. 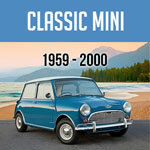 The Classic Mini Coopers with automatic transmissions have unique engine blocks - you can't just swap out the blocks from one to the other - the whole power unit must go and be replaced with a manual block and transmission. 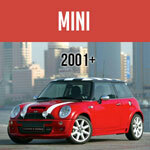 See the list below for some of the parts available at Mini Mania that we used in this swap. You'll need a pedal box, too. Call us at 1-800-946-2642 for details.